On Friday, the final event of the McCloskey New Venture Competition featured live presentations to a panel of judges, including Daymond John from ABC’s Shark Tank, Matt Rodgers from NEST, Mark Foley CEO at ZELTIQ, Dan Peate of Peate Ventures, Tracy Graham from GrahamAllen Partners and Swati Mylavarapu, Rhodes Scholar and founder of Incite Labs. 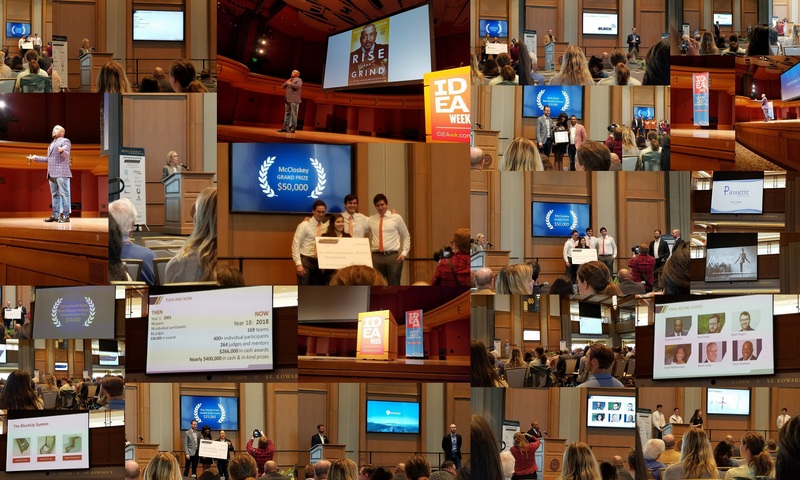 The six finalists competed for over $400,000 in cash and in kind prizes, including an audience vote for the $5,000 Sutherland Family Award for best presentation. SAP Next-Gen is an innovation community for SAP Leonardo which drives innovation with purpose supporting SAP’s commitment to the 17 UN Global Goals for sustainable development. SAP Next-Gen enables corporations, governments, and NGOs to connect with academic thought leaders and researchers, students, startups, tech community partners, venture firms, purpose driven partners, and SAP experts. Corporations and partners can reimagine the future of industries with SAP Leonardo, seed in disruptive innovation with academia and startups, and build skills for digital futures. Many of the finalists and award winners targeted solutions related to the United Nations Sustainable Development Goals so I have described a few of them below. Enlighten Mobility is a medical device company that has embraced individuals who typically fall through the cracks of medical care. The organization is launching its first product, The Enlight Walker, which reestablishes healthy walking patterns for lower limb amputees the same day as the operation, dramatically decreasing the physiological decline and increasing rehabilitation speed. The forearm, gait-trainer ambulatory device facilitates a kicking motion and enables weight bearing on the compromised limb while maintaining wound integrity and empowering the patient to succeed. Hurry Home brings buyers and sellers of houses worth $50,000 or less together on a full-service platform that brokers the relationship, services the loan, and provides an exit for sellers, while creating an opportunity for real estate investors. Sellers benefit through a quicker exit at or above their asking price with minimal effort, while low to moderate income families are given the opportunity to save money and build wealth through a unique home loan focused on protecting their rights. Impowerus connects juvenile immigrants with attorneys performing pro bono immigration work. Studies confirm that having legal counsel significantly increases the chances of receiving a positive outcome in immigration proceedings. Impowerus combats both the need generated by the lack of reliable legal services and the high costs of doing pro bono work. In addition to aiding juveniles through the immigration process, Impowerus allows lawyers to more efficiently perform and track their pro bono hours through our easy-to-use, secure video chat software they can use from the comfort of their desk. Uber Manufacturing. Leveraging the trends of the “Gig Economy” and addressing the needs to train individuals with manufacturing skills, Uber Manufacturing creates the opportunity for those who seek to learn and develop skills at their own pace through hands-on experience. We enable local manufacturers to outsource low to medium skilled jobs such as assembly, testing, sorting, counting, packaging or rework, to a company designed to quickly understand the need and provide the solution. We take on short term manufacturing problems and resolve them quickly, efficiently, and economically through independent contractors. One finalist will be given an opportunity to pitch to the IrishAngels Investing Group; value is $25,000. Awarded to a team affiliated with the University of Notre Dame. On the evening prior to the competition, Daymond John held a session where he explained how he went from driving cabs and waiting tables at Red Lobster to creating a global fashion empire with retail sales exceeding four billion dollars, and a starring role on ABC’s hit reality business show, Shark Tank. It was an entertaining talk with true-life tales of his incredible successes and numerous failures. Daymond shared the exact goalsetting strategies that he attributes to his success and taught audience members how to incorporate them into their endeavors. It was a very informative session. The McCloskey competition was a key event within the IDEA Week innovation festival which hosted business, technology, and entertainment events to provide entrepreneurs, students, and community members in the region with the practical knowledge, creative inspiration, and social foundation they need to innovate within their own careers, studies, and communities. SAP provided sponsorship for IDEA week and the ND MBA Tech Innovation Challenge in particular.